Every pregnancy and postpartum journey is different, so don't worry about what so and so are doing, what happened to this or that person or how quickly a friend of a friend 'bounced back' after having her baby. Do what is right for you. We get it because we've been there, being a new mom is a whole different world and for most new moms, this means that the freedom of going wherever you want, whenever you want no longer exists once the baby is welcomed into the world. That is why we are expanding what we offer; in addition to our Group Classes and Personal Training, we are now providing services for Remote Individualized Postpartum Programming and Coaching so that you have the ability to get a work out in on the days that leaving the house seems impossible. Pregnancy is usually perceived as something incredibly delicate that needs to be coddled, yet there is an stark contrast on how we view the postpartum stages. It's almost expected that we are up and running after having a baby. When you think about it, it takes 40 weeks to grow a child and for some reason, somewhere along the way, we decided that we wanted everything in our bodies back to normal in 6 weeks. It's true that there are times where some pregnancies are more precarious than others and demand more care, attention and rest, however, there are also situations where the expecting mom is just unsure of what is safe. This has resulted in an overly cautious population while in our prenatal stages and overly cavalier in our postpartum stage. There has been an real shift in the mentality of what people now know women are capable of during pregnancy but it can still feel like there is a lot of gray area when it comes to exercise while pregnant or recovering. 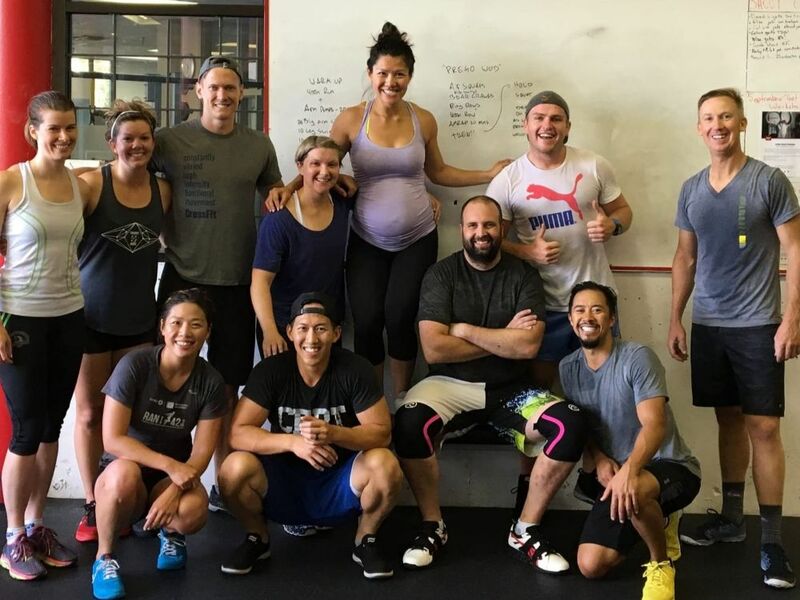 Anne and Jason dropping in at their old stomping grounds, CrossFit Westside in Vancouver, while Anne was 7 months pregnant. Work out of the day was named "Prego WOD"
Pregnancy can be very demanding, be it mental, emotional, physical or a combination. By adopting a healthier and more active lifestyle during (or even more ideal is PRIOR TO) pregnancy is full of benefits for both Mom and Bub. Of course, you always want to check with your doctor to ensure that there are no extenuating circumstances or medical risks. If you get the green light to continue exercising and staying active, then there really isn't any reason not to continue being active. The question we are asked most by prenatal moms that we train is "but I heard that I should always be able to keep a conversation going when I am working out, is that true?" There's no right or wrong answer to this question but we all know someone (maybe ourselves) that isn't pregnant, walk up a flight of stairs and that would leave them short of breath. So the idea that "you should be able maintain a conversation while you are pregnant and working out" as a blanket recommendation is grossly misleading. For postpartum moms, the common questions is "What is safe to do while I am recovering?" What we will suggest for both questions is that we adopt a more reliable gauge for each individual. RPE or RATE OF PERCEIVED EXERTION is exactly that; what do you feel is the level of effort you are putting forward. Every single pregnancy and postpartum journey is different, so to have a blanket statement of allowing continued conversation or entirely cutting out certain movements to be our metric isn't very reliable. Instead we will ask my clients how they are feeling and if what we are doing is too much. Of course there is a level of recommendation on what is reasonable from our end but at the end of the day, you know your body best and you know whether or not something feels manageable. What feels normal and manageable to me or you may not be the same for the next person. So instead of comparing yourself to others, whether it is how hard they push or how much they pull back from training, we all need to learn to listen to our bodies. Carolyn, performing thrusters at 8 months pregnant. Carolyn was a group class athlete, turned personal training client; she had some preexisting injuries when she started CrossFit and was very keen about addressing these nagging issues prior to starting a family. She stopped group classes and started personal training exclusively. Once she felt the injury symptoms subside, she returned to group classes and still incorporated Personal Training into her schedule twice a month. She worked out into her 9th month of pregnancy and recently welcomed a beautiful baby girl! We are big advocates of being smart about your training at any stage of your pregnancy, prenatal or postpartum. If staying active before, during or after pregnancy is something you or someone you know would benefit from, book a No Sweat Intro to come in, meet with Anne and determine what is right for you!